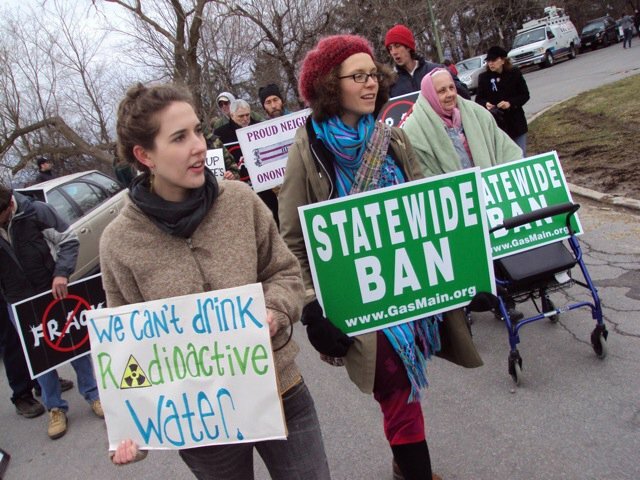 On January 9, 2,000+ fracktivists rallied for a fracking ban outside Cuomo’s State of the State address. The next day, January 10 the Assembly Environmental Conservation committee heard 11 hours of testimony on the proposed regulations. Friday January 11, our allies in the New Yorkers Against Fracking Coalition delivered 204,000+ comments to the DEC on the proposed regs, all including a call for a hydrofracking ban. Below are the official comments submitted to the DEC from the Green Party of New York State – our candidates, including 2010 candidate for Governor Howie Hawkins, all support a statewide and national ban on hydrofracking. Contaminated drinking water aquifers and wells, reservoirs, lakes and streams. Toxic waste ponds full of the waste fluids that come back up the wellbore; there could be up to40,000 of these ponds across the New York State if full-scale fracking is permitted. Air pollution from flaring (burning “excess” gas to relieve well pressure), along with pipeline and compressor station venting and leaks, release of nitrogen oxides, particulate matter, sulfur oxides,benzene, toluene and other volatile compounds — all of which contribute in various ways to cancers, genetic mutations, nervous system disorders and lung disease, along with increases in rates of CVD, stroke and asthma from increased amounts of diesel exhaust, flaring and compressor station exhausts. Global warming increase due to carbon dioxide from flaring and methane from leaks, with methane (the largest component of unrefined natural gas) being 72 times more potent as a greenhouse gas than carbon dioxide over 20 years, according to the International Panel on Climate Change’s measure of Greenhouse Warming Potential. Natural gas can seep into water systems and homes to pollute kitchen faucet water so it can be lit on fire, and cause houses and drinking water wells to explode. 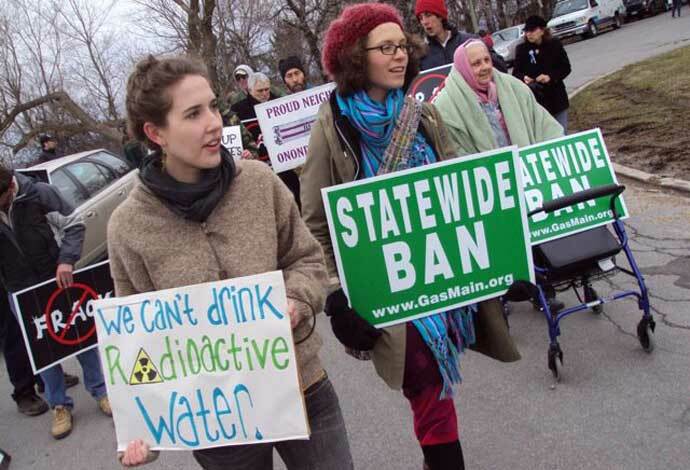 Heavy metals and radioactive substances can also seep into the water systems of many rural upstate New York homes with private wells and no access to municipal water. Loss of hearing, vision, taste and smellRepeated or prolonged exposure can cause liver, heart, blood and brain damage as well as leukemia and other cancers. The chemical constituents in fracking fluid can be hidden from the public—and from medical professionals—at the companies’ request. And this provision goes to the heart of why fracking cannot, under these circumstances, be regulated. Weak, arbitrary setbacks (Section 560.4): Setbacks are distances from drilling pads. There is no scientific basis for claiming that 500 feet provides safety. It does not take cumulative impacts into consideration, as when your home is surrounded by multiple well pads. Also, evidence from Colorado shows that air pollutants from drilling and fracking operations travel much farther than 500 feet and that people living within a half mile (= 2640 feet) from a well pad can experience health problems. Long-distance air pollutants from drilling and fracking operations include benzene (a known cause of leukemia) and methylene chloride (an ingredient in paint thinner and a known brain poison). A new study found 44 hazardous air pollutants in the backyard of a Colorado home located 0.7 miles from a state-of- the-art drill pad – seven times farther away than 500 feet. Another alternative the Department has considered is the denial of permits for HVHF in New York State. This alternative would fully protect the environment from any environmental impacts associated with HVHF but it would also eliminate all of the economic benefits that could be generated by the activity. This alternative also contravenes New York State’s declaration of policy in Article 23 of the ECL to develop oil and gas resources that will maximize the ultimate recovery of those resources. The state could avoid these costs if it chose the no-action alternative (otherwise known as a ban on fracking). In so doing, it would sidestep the anticipated task of assessing human exposures (along with the need to publish reports with titles such as, “The Impact of Drilling and Fracking Operations on the Health of New Yorkers Living in Areas of Intensive Shale Gas Extraction”). However, that option directly contradicts a standing policy that says New York must maximize its extraction of oil and gas. Preliminary research from Pennsylvania finds evidence of harm to newborn babies whose mothers spent their pregnancies living near drilling and fracking operations. There should be definitive research before we place New York’s infants at risk. Developmental problems in newborns are expensive and often necessitate lifelong medical and educational interventions. The State overstates the job creation potential of hydrofracking. The DEC’s assertions lack a time frame and ignore the temporary nature of the jobs created. According to a critical report prepared for the Southern Tier Central Planning and Development Board, the vast majority of the employment generated by natural extraction is concentrated in the drilling phase, which lasts only 10-15 years, leading to a boom and bust economic cycle.